"I salute President Trump and the U.S. flag every day to show how much I trust him," Chung told Reuters as he attended a recent anti-North Korea rally in sweltering summer heat in downtown Seoul. "I salute to pay respect to Mr Trump, supporting his reign as the leader of the world and guardian of liberty." [post_ads]For many South Korean conservatives who liked Trump's initial tough talk against North Korea's Kim Jong Un, his abrupt embrace of the autocratic leader at their historic Singapore summit in June was nothing short of a betrayal. Trump, who ridiculed Kim as "rocket man" last year, has since called the North Korean leader "funny" and "smart" and even praised his ability to retain his authoritarian grip on power. "Trump said Kim is an 'amazing leader', thus legitimizing him. This makes us, the patriotic citizens, feel betrayed," said Cho Won-jin, leader of the right-wing Korean Patriots' Party. "I have saluted Trump today as always with utmost sincerity," said 76-year-old demonstrator Lee Yoon-jo, nodding at a large picture of a beaming Trump at a demonstration in downtown Seoul. 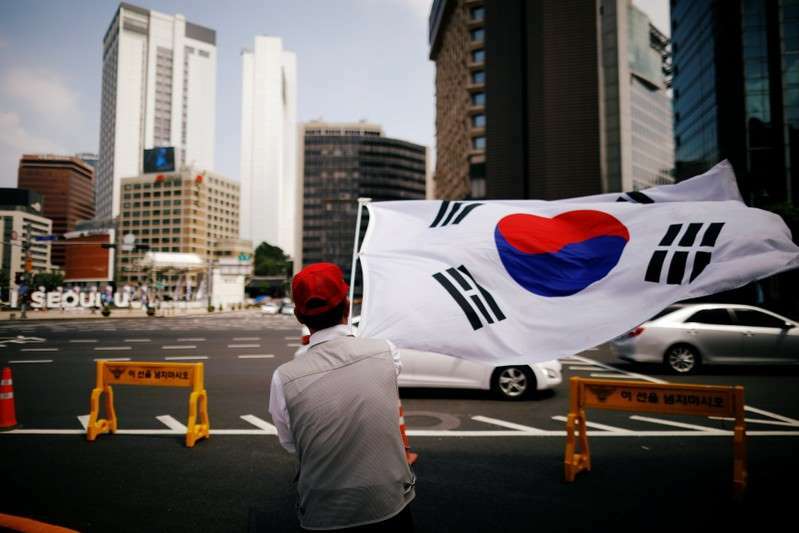 As he saluted, demonstrators held giant U.S. and South Korean flags in front of the U.S. embassy, alongside banners in Korean and English reading "The United States is a thankful brother country that has been devoted to a free Korea". Gratitude for U.S. support in the 1950-1953 Korean War as well as anti-communist rhetoric used by the South's military rulers in the 1970s still resonate with many older South Koreans, said analyst Jeong Chan-dae of Sungkonghoe University. "To these elderly conservatives, the U.S. is more than just an ally and more of a 'savior'," he said. Holding a faded black-and-white photograph from his time he fought alongside American allies in the Vietnam War in 1968, Chung said: "Without the U.S., South Korea would never have been able to exist." Standing on a corner in Seoul, surrounded by flags and anti-North Korean banners, the small knot of demonstrators are unfazed by the shift in tone, noting that Trump could still resort to "regime change" if a denuclearization deal doesn't pan out. "President Trump has always masterfully guided and protected South Korea and the free world and always will," Lee said, again giving a military salute. "Thank you, Mr President."